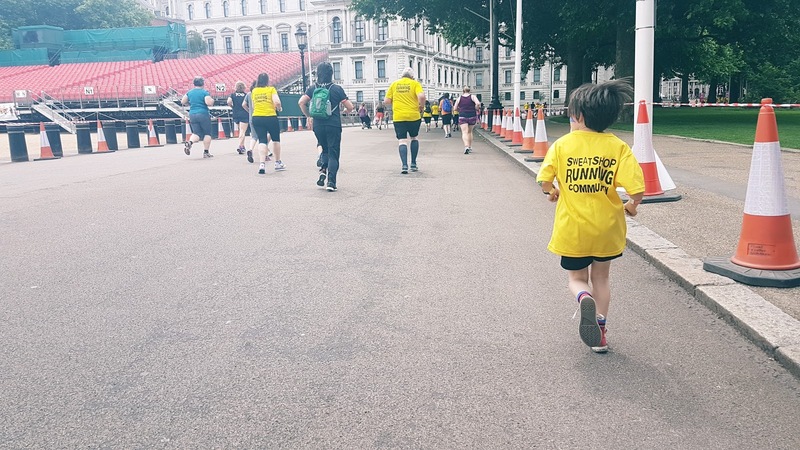 The Westminster Mile has become a bit of a family tradition and the 2017 event was fifth year of the event and the fourth that I had taken part in. As I had in the previous few years I entered the race via Sweatshop and ran in one of their waves. 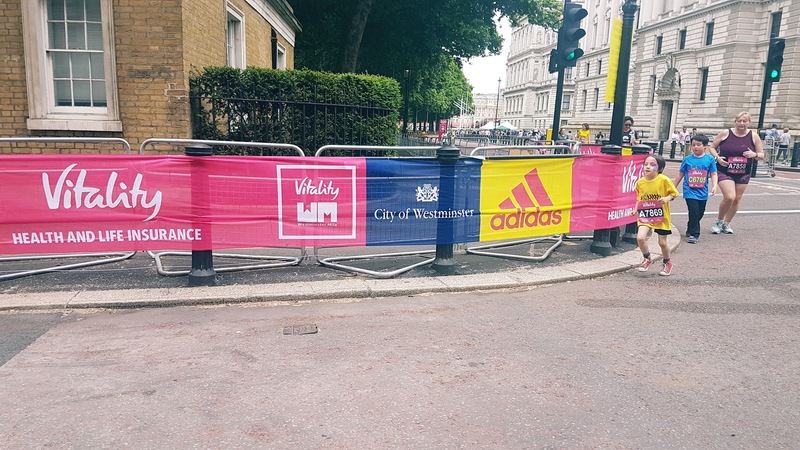 The event takes place on the late May bank holiday weekend and uses the same set up as the London 10000 event which takes place on the Bank Holiday Monday. Last year (2016) I ran in both events, but for this year I had a bit of a dodgy ankle and decided to just stick with the 1 mile event. I wasn't feeling particularly racy, so I set myself the goal of running an even pace and aimed to come in a smidgen under 6 minutes. If I was going for a full-on race I would have ditched the Sweatshop Running Community t-shirt that I was wearing and opted for a singlet instead. These days I find that during races even a short-sleeved tech t-shirt makes me overheat. So I had registered myself, my wife and my daughter, and we arrived in good time to wander around the event village where my daughter had her face painted in the kids zone. There are always loads of activities going on in Green Park and worth spending some time checking it all out. We had been put into Sweatshop Running Community's first wave which had a 12 noon start time. 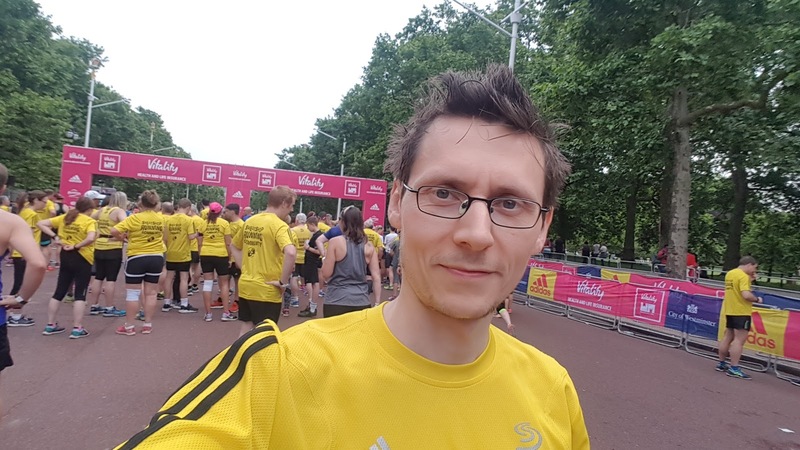 At about half eleven I started to warm up with a jog around Green Park and I then made my way to the start on The Mall. As I was going for a sub-6 minute time, I headed up towards the front of the starting pen while my wife and daughter stayed closer to the back. At the 2016 event my daughter had set a personal best time of 12.11 which she wanted to beat this year. At 12 o'clock on the dot, the air horn was sounded and we all headed of along The Mall with St. James' Park on our right hand side. I kept my pace relaxed but strong. The first 400 metres were a little congested as my sensible pace tied in with most other runners' 'run as fast as I can for 200 metres and then suffer the rest of the way around' pace. By the time I reached the 400 metre mark, I had found some clear air and the timing clock showed 1.27 which was right about where I needed to be time-wise. Once past the 800 metre mark at 2.54 and turning onto Birdcage Walk there is a slight rise of elevation which slowed my pace a little. With 400 metres to go the timing clock was on 4.27 and all that was left to do was maintain that pace and I successfully continued my sub-six minute streak with an official time of 5.57. 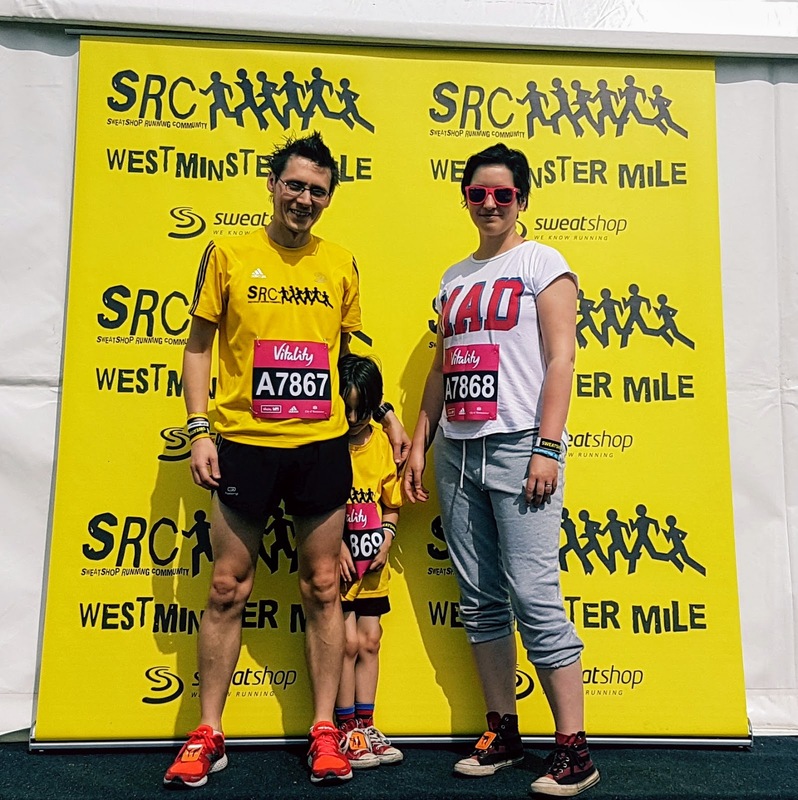 A few hundred metres down the road, my wife and daughter were making good progress and after a few minutes of loitering around the finish area, I spotted them heading towards me. 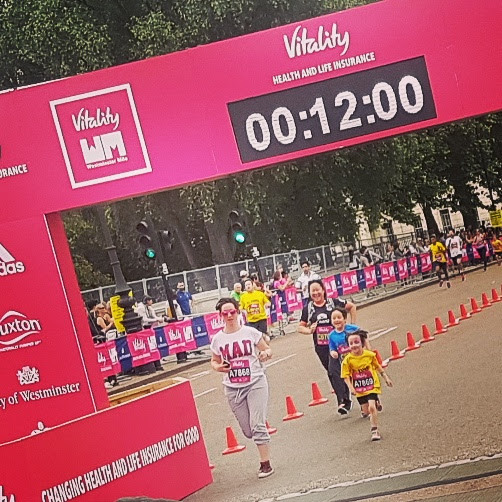 The clock showing just over 12 minutes, but by the time the official chip times were confirmed it showed that my daughter had set a new mile personal best of 11.51. 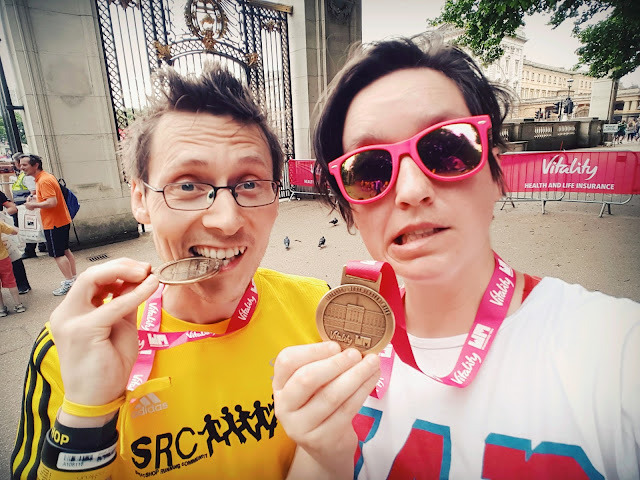 With that all done, we had our timing chips removed, picked up our free lunch from Sweatshop, and collected our goodie bag and medal from the wonderful team of marshals that had made the day possible. We didn't have much time to spare after the run as we had already arranged to head off to watch the Monaco Grand Prix with my brother (on the TV, we weren't actually jetting off to Monaco), so we shot straight off to do that. It had been another excellent morning at the Westminster Mile and I'm already looking forward to doing it all again next year.